If you’ve read our recent 2017 in review article, you will know that building the most efficient protection software while keeping it as simple and easy to use as possible is very close to our hearts. As we continue to evolve our solutions and add new features, we regularly review the status quo and think about how we can implement existing functionality in smarter, more elegant ways for our customers. We trust you’ll enjoy the tweaks and refinements we have made for our 2017.12 product updates. If you have got more ideas on how we can create an even better protection experience, then let us know in the comments. We love hearing suggestions from you, our customers. 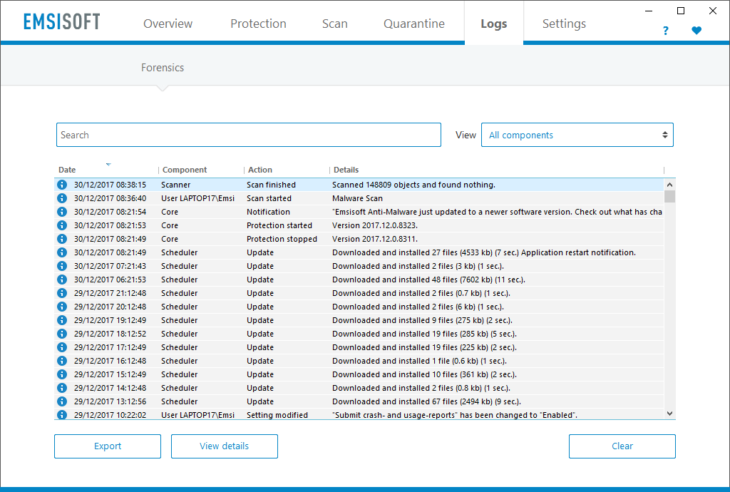 New: Merged all individual logs into one universal forensic log that can be more flexibly sorted, filtered and searched. New: Added an automatic seat rotation system for multi-seat keys to make the most efficient use of such licenses. Improved: Possible compatibility issue warning when another installed Anti-virus/Anti-malware program is detected, to avoid system crashes. Improved: Initial integration with Windows Security Center after installing via MSI installer. Improved: Ability to manually resize the main overview screen. Cleanup: Removed setting “Maximum simultaneous update connections” as the software now determines the best setting automatically. Cleanup: Removed setting “Enable/disable logging” and “Logging limit” as the software now determines the best settings automatically. Cleanup: Removed setting “Protect PC if no user is logged on” as the protection is now always on unless protection is manually shut down. Improved: Synchronized all changes in available settings with Emsisoft Anti-Malware. Improved: Update proxy server management. Have a great, well-protected day and start to 2018!